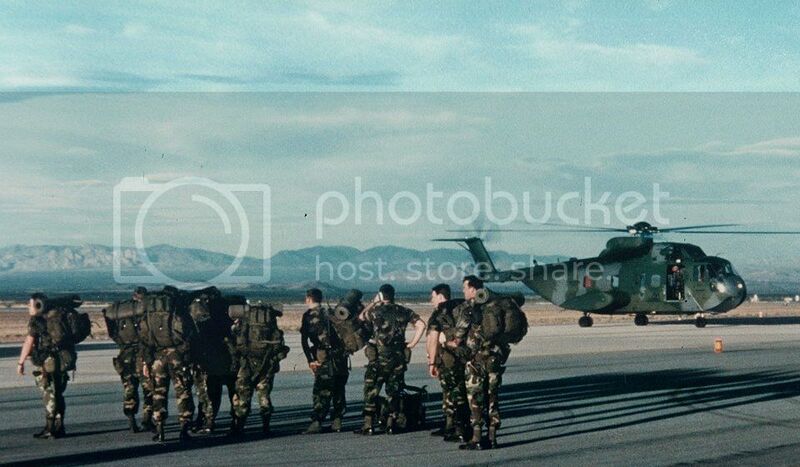 I am collating all the information I can on the events of 12MAR89 that resulted in the crash of a Air Force Reserve Helicopter that took the lives of 11 Special Forces soldiers from the above ODA's. This incident occurred in Arizona after a refueling stop at Davis-Monthan AFB enroute to the Gila Bend gunnery range. My father was one of the SF men who died on that night, and I have access to a lot of the information my mother gathered after the crash. My purpose in gathering this information is to produce a wikipedia entry on this event and to create a tribute website for them. In the 26 years since the crash there has not been a single reunion or a collaboration of information that honors their memory. It is my intent to change that. If you, or someone you know, was attached to 5th Group during that time, or has intimate knowledge of those events, please reach out so that I might have your information to supplement what I have access to. I understand the closeness of this community and if I need to be vetted prior to someone speaking to me about this, then please feel free to contact me. I will be happy to provide you with whatever information you might need. I went to SFQC and was friends with a number of the younger SF soldiers on that bird. There was some mention of a reunion in 2013 in this thread along with an email: http://thisainthell.us/blog/?p=34507. I don't know if this is you. There is also a webpage with many crash details, photos of the crash site, and a forum in which family members and friends have commented. If you haven't found it yet, a quick Google search will. I was deployed for most of 1989/1990 when this happened and didn't find out about it until reading an old Army Times magazine during a dental appointment in Panama. I immediately cut out the article and still normally have a paper copy with me even when I travel. I'm in a hotel now and just took a photo of the article for you. Good luck to you. These were all good men. Last edited by HighDragLowSpeed; 19 August 2015 at 04:49. I'd be glad to assist in getting the word out to my network to address your request. Have you reached out to the SF Association? PM me your contact info, I will use your OP or you can expound and I will circulate your request among some of the active senior leaders and retirees. CW, I was assigned to The Legion when your father was killed (But sadly, did not know him). I was briefing COL Harley Davis, the Group CO when the trees memorializing your father and his rest of the guys in his crew arrived at Group Headquarters. He ran out of the briefing and wanted to make sure things were exactly correct. Many men from the 5th SFG(A) have died in both training accidents, even more so in Combat. Sadly, too many to count. Every year or so the 5th SFG(A) has a reunion. I can put you in touch with the guys from the Special Forces Association in Clarksville that aid in organizing it. This is where the memorial is and an appropriate place for your efforts. 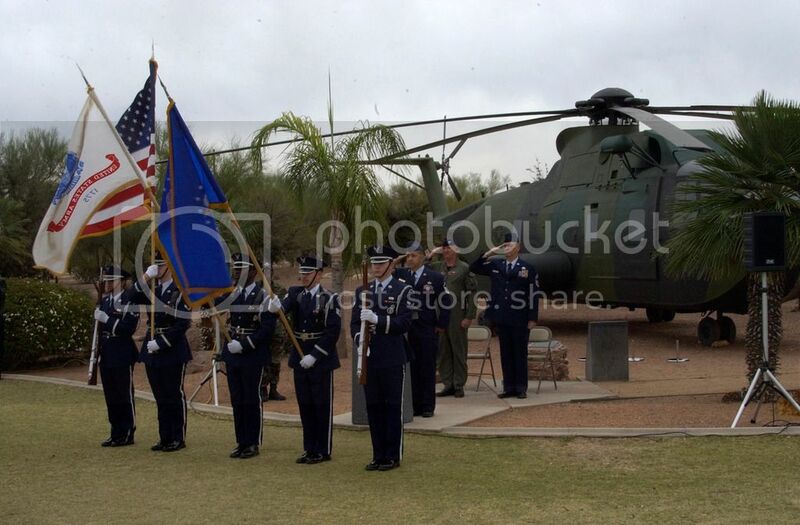 I remember how this tragic accident rocked the Air Force CH/HH-3E community. We were grounded for months while the accident investigators worked to determine the cause of the crash. The H-3 fleet had decades of service at that time and were considered extremely reliable, and when Pony 12 went down in the desert for no immediately apparent reason we were shocked. No doubt you're familiar with the accident investigation and the legal issues that followed, but if there's anything I can do to help just ask. The memorial to Pony 12 out at DM is very nice. It's been a long time since I was there, but I used to visit whenever I was in town. The memorial was truly a labor of love done by the 71st SOS and 305th RQS folks that made it happen. Condolences for your loss. The sacrifice of your father and the other men that died that night is not forgotten. Guys, Thank You for your kind words and assistance, reading your words literally sent chills through my body. There was some mention of a reunion in 2013 in this thread along with an email: http://thisainthell.us/blog/?p=34507. I don't know if this is you. I immediately cut out the article and still normally have a paper copy with me even when I travel. I'm in a hotel now and just took a photo of the article for you. That is awesome that you carry that article with you. Every year or so the 5th SFG(A) has a reunion. I can put you in touch with the guys from the Special Forces Association in Clarksville that aid in organizing it. This is where the memorial is and an appropriate place for your efforts. I have access to the original crash report as well as the private report that was conducted prior to the legal issues. From my understanding, the families were required to sign statements of non-disclosure after they accepted a settlement from Sikorsky. I had assignment orders to 7th Group at Fort Bragg when it happened. A couple of days before I arrived I got the word that my orders had been changed to 3/5th. Up until that time I didn't even know that 5th Group still had a battalion at Fort Bragg. The personnel officer at Fort Bragg told me I was a replacement due to losses in the crash. That put a cloud on things. For an outsider stepping in, it was a somber environment. Officers and NCO's in C Company were working casualty assistance and that had to have been a tough job when they knew the deceased and the families. A year later I ended up in ODA 592 which I thought also had a few losses in the crash. When I was the TL on 586, Roger Berryhill was my Senior Comms Sgt. Alan Brown, Berryhill and myself were a part of an overseas operation in the mid-80s. Kevin Livengood was my Junior Comms Sgt on ODA 564 when I was the Team Sgt. Larry Endress and Larry Evans were with a bunch of us on some other missions. I vaguely recall Bob Griswold from some other work we did in 3/5. Myself and two other Soldiers from 3/5 just returned from a mission in EUCOM when we were pulled off to the side by the battalion Command Sergeant Major and told the news. Definite gut punch that day. The Team never dies; but it still hurts to lose Teammates. Rest in Peace Teammates. See you in Valhalla. Today, I reached out through my contacts at the SOWF and got a huge amount of help with my project. I sent them a letter that they are going to email to every family member they have contacts for from this accident. It is my hope that they will embrace my project and contribute to it's success. I will post a copy of the letter in my next post just in case some of the family members find it in a web search. I still need the help of this community however, I would like to find some of the men who were on the second helicopter that night. They can provide much needed information about events prior to the crash. I reached out to the Warrior Foundation and asked them for their help in locating you. It has been 26 years since we lost our fathers, husbands, brothers, and friends. In that time I know many of you have been searching for answers about what happened that night. I have seen several of you post in message boards where people have made tribute to these men. You are not alone in your search for information. I started a while ago asking my mother for the documents she has about the crash with the intent of creating a Wikipedia article to honor their memory and sacrifice. Those aspirations have grown and I intend to finish the article, but I also intend to create a website that will tell their story. My vision is for this website to have a main page that tells the collaborative story of the mission and the crash; and secondary pages that tell the story of each man. It is in this area where I will need the help of each of you. I did not know your fathers or husbands and therefore, I cannot tell their stories. In the coming weeks I will be purchasing the web domain for this memorial. I have a talented web designer who has offered his services for building the site. My aspirations for this website also include, at a later date, some fundraising so that we may erect a permanent memorial at the crash site, and possibly an annual or biannual fundraiser to benefit the Warrior Foundation. Perhaps at some point we can put together a reunion that coincides with the day we lost our fathers and husbands. 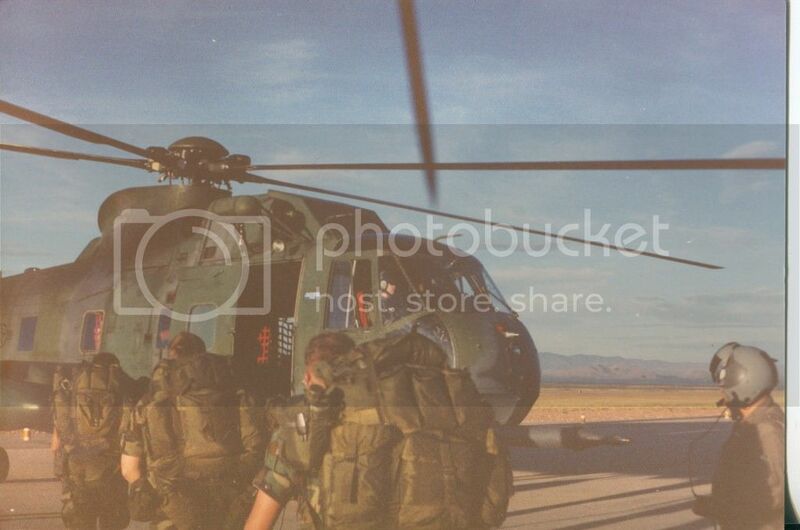 I have word out through the SF community looking for some of the men who were onboard the second helicopter that night. It is my hope that those men will shed light into the events prior to and after the accident that we as family members were either to numb to hear, or just not told. During my research, I have found that members of the planning committee for the 5th Group memorial at Ft. Campbell have been looking for us, so that they can extend invitations for us to attend their annual memorial. I understand how hard it is to think back to those horrible days when our lives were changed forever. But I believe that this project will serve to honor those men and their memories. If you would like to participate and/or contribute to the project please feel free to contact me at the email address below. 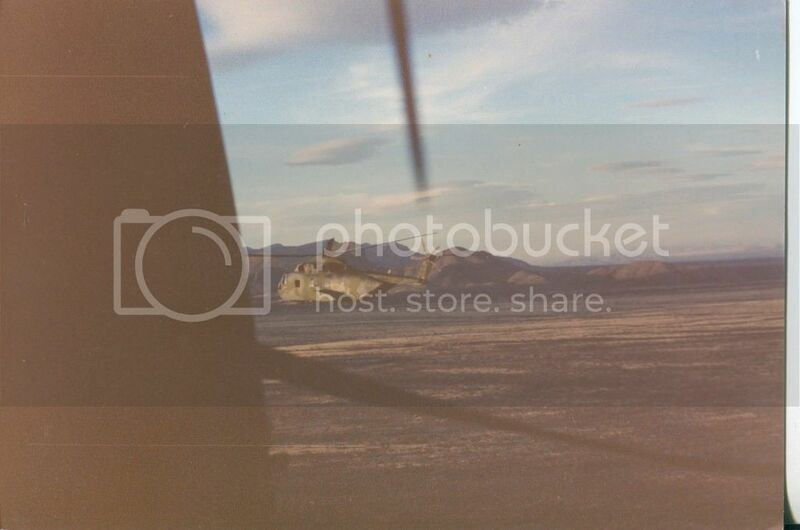 The photos are the last known photos of the helicopter. One was taken at Fort Huachuca, Az as the SF men boarded, the other was taken in flight enroute back to Davis-Monthan AFB for fuel before carrying on to the Gila Bend Gunnery Range. 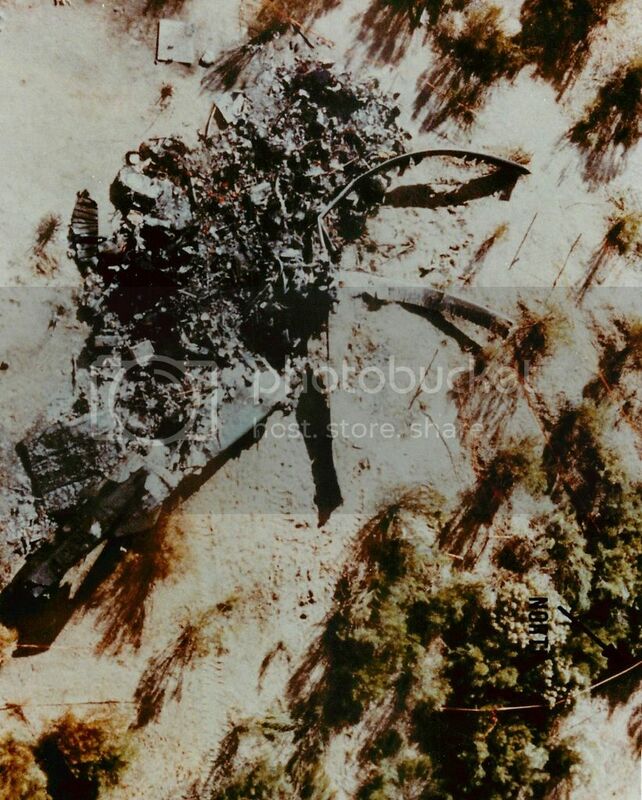 The final photo is an aerial shot of the crash site. Your Father would be proud of how you are keeping the memory of him and his crew alive. Thought you guys would like to see a photo I received the other day. I will attach it below. I believe this is all 11 of the men who perished. I can identify my dad as the second man from the left. Lots of things have happened with this memorial. One of the Pilots brothers has jumped on board full speed ahead and helped me make a lot of progress. He knows and is friends with a land owner in the area of the crash. This gentleman is going to help secure some land (possibly the crash site) for a permanent memorial to be constructed. I located a sister helicopter to the one that crashed. 65-5693 is in long term storage in the Arizona desert at AMARC. I have written nearly 20 letters to people within the government trying to get possession of the helicopter for use as at the memorial. All of the families I have made contact with have been awarded the Gold Star Lapel Pin in honor of their loved ones. 30 of the pins have been shipped. I have found quite a few of the guys who were on that mission and spoken to several of them on the phone. They have given me some valuable information about the days prior to the accident. I am still seeking out the others to get their memory of the mission and add it to the story that is developing. The memorial website is under construction and should be live in the next month or so. I will come back and post an update with the web address when the site goes live. Wow, great./ Thanks for the update. Your dad and his team mates would be proud of what you are trying/going to do.. I was both saddened, and at the same time touched, to see this thread. I was very good friends with Larry Endress, having gone through the Q with him a couple years prior to this. Larry and I had both also gone through the Q with another guy, Matt White, who took it especially hard. Larry had replaced Matt for the deployment due to Matt having some family issues. Matt never got over the guilt of knowing it should have been him on that aircraft instead of Larry. From what I understand Matt slipped into addiction and some bad behavior, was put out of the service, and from what I have heard, was later murdered in Charlotte, NC. I was in Panama at the time, and remember very well, the call I got from my wife at the time telling me about this. What you are doing is awesome, and I am so happy you have found success in your endeavor to remember all of them. So sorry for your great loss of 26 years ago. As you can see from the responses here, all those guys were greatly respected, and have never been forgotten in our community. Best of luck with your efforts going forward. I am tagging on to this old thread as I'm the current Team Sergeant of SFOD-A 5331, formerly 591, and I am trying to get pictures of the fallen soldiers from this accident to put in the team room. If anyone out there has photos, or knows how I can contact the families I would be extremely grateful. Welcome bro, and thanks for coming here. Can you please do a formal intro in the intro thread. Thanks again and good luck.